Hello my friends, and Happy Thursday! We are now two full days into Lent, and so that means ... this post was meant to have posted two days ago! (It's rather ironic I felt compelled to give up "complaining" for Lent this year, because I feel like I've been more prone to it than ever lately ... and that's not normally my nature. Generally speaking, I'm very much a "glass is half full" kind of gal - but then maybe that's the point? Lent is a great time to work on one's weaknesses and address any negativity in one's life. So my strategy is this - each time I find myself complaining or feeling the urge to do so, I stop and think about (or ideally, write down) something to be grateful for right that very moment. I'm two days in and so far, I've surprised myself with how often this happens! For this I printed out the words "Alleluia Alleluia" on paper, cut them into a small strip and then we tucked that paper inside a small sack (a muslin mulling bag!). That sack was then placed inside the plain brown, butterfly-shaped box shown above. On Easter morning the boys will find the box open, and the sack empty. There will be, however, a beautiful banner strung across the grapevine cross hanging above the mantle, joyously announcing, the theme of the day: ALLELUIA! We've had this cross for years and I'm fairly certain I bought it at Michaels Arts & Crafts. (I've seen similar ones at Amazon, but for WAY more than I paid! I think I paid well under $10.) True, it's a little worse for wear, with one or two broken vines now, but I adore it - nature and faith in one symbol - and use it pretty much year round. At this time of year, though, it plays a very special role! Throughout Lent then, I start adding little bits of (silk) greenery and so the boys see this cross as very much "coming to life" as we near Resurrection Sunday. On Easter eve, before heading to bed - because NOBODY beats Earlybird when it comes to waking - I stuff this cross full of fresh, colorful blossoms. (I always buy an extra bunch of flowers just for this purpose. Nothing is blooming in New England in March and April except possibly for a few tender crocus!) Across the front of the cross, covering up those wooden letters, I hang the aforementioned Alleluia banner. Right now, in the dead of winter, all seems very still. But it's good to be quiet and let the earth sleep - it needs it! Soon though, if we are patient and pay close attention, we will be rewarded with signs of new life! "I like to have nice things. I like to buy treats. And I like to eat my favorite foods. But not all the time. There are times for filling up and times for emptying out. Lent is a time for emptying, for sharing, for giving away. It is good to make space." p.s. Mitten Strings Tea is coming but MAY not be up Friday afternoon as originally promised. I will do my very best to have it up by Sunday at the latest! Hello my friends and Happy Monday! I bought this multi-color ink pad at the craft store, and it has enough colors for each person in our family, if Mom and Dad share a color. Each evening at suppertime we will press our fingers on that pad and then add our own unique fingerprint to the plain cross on our door. (Little Bear will need to be lifted, natch!) These prints will represent our daily Lenten offerings, whatever they may be. (The boys will be welcome to share with the family or keep their actions between them and God.) In theory, we will do this each night but I know how "daily activities" tend to slide as time goes on ... so I'm prepared to do a weekend "catch up" if needs be. :) I also checked that the ink is washable since Earlybird is so sensitive to dyes and fragrance. I tried each of the colors on my own fingers and they all washed off readily. I also made up a Lenten binder for myself (since I'm the designated cruise director on this here family ship!) and inside I have a page for each day throughout Lent with an idea of something easy to do or suggest to the boys. I've also been adding some small post-it notes when I get an additional idea for a certain day. For example, I remembered a book we had about Pope Francis that would be nice to read on the Feast of the Chair of St. Peter (Feb. 22nd). Also, I remembered the Full Sap Moon is rising on March 1st, St. David's Day, so I added a "family moon walk" for listening to spring sounds and feeling blessed by the turn of the seasons. I could have added these sheets to my main planning/home & family binder but since they are quite bulky and because I had an extra PURPLE binder on hand, I decided to make it a special book of its own. 💜 Filed in the remainder of the sheet protectors I have printouts from the library of all the books I want to request over the next several weeks, as well as a list of seasonal books we already own. (I spent the weekend unearthing those books from the basement!) I MAY also add coloring pages and/or craft projects/recipes as I have time to print them out ... but that seems a little ambitious at the moment, so we'll see how it goes! All kidding aside, I do think it's vital to stay flexible and try not to get frustrated, when planning any and all areas of life. This is something I have to work at, constantly. I'm a planner, as you know. I make a lot of plans - I LOVE them - but I love my family even more. When things get off-track, it's important that I check my disappointment - to remember my intentions were good, to remember the end goal - and to adjust my thoughts (plans!) accordingly. For example, I had something a bit more "hands on" sketched out for today but - with a very sick Little Bear who was up half the night - I knew my plan would have to be changed up a bit. A quiet read-aloud and a coloring page quickly printed off the internet would have to suffice. And tomorrow's "Irish Tea" may not happen as I originally thought either (my mum is also sick), so I'll simplify that day's plan, still keeping in mind the Feast and our family's intentions. Oh and Monday's sunrise prayer? The day after we hosted a large party AND lost an hour of sleep? Well, an early rising was simply NOT in the cards. (As you might imagine!) Instead, I thanked my loved ones for all their help and hard work and encouraged the children to do the same. (Who can you thank today for their help?) So the sunrise activity will be rescheduled on another day in the near future ... maybe even Easter Monday? One good thing is I've kept that master outline to myself (tucked away on my clipboard) and I write each post-it out before bed ... so I've been able to tweak our plans daily. And if a day's proposed plan looks to be an ill-fit, I can simplify on the spot: Read a book from our liturgical bookshelf. Do something nice for somone else. Sit quietly for five minutes and think of what makes you grateful. Admittedly, I put a lot of time and thought into those plans, and I tried to keep the activities simple and meaningful. But the point of our Lenten journey (and all of my "plans") was not to keep busy and pull off 40+ crafts and activities, but instead, to slow down and focus our energy on a purposeful Lent ... sharing mercy, developing generosity, accepting responsibility and increasing tolerance. Being mindful of how others live, recognizing their needs, and respecting our place in the world around us. My hope - or end-goal, if you will - is that by lighting a spark of compassion, we're tending the fire of Christ in our hearts. And come Easter Sunday, we may shine all the brighter! Plan or no plan, that's what we're all aiming for, I believe. Well, my friends, this post went on a bit longer than I planned, but I thank you, as always for reading. I'm grateful you spent a little of your day here at "my place!" Enjoy the rest of your Wednesday, and I will see you here again very soon! Just below the mantel I hung our Stations of the Cross collection. I will be back again before long - because I always have things to talk about! And more pictures to share, too. But for now, I wish you all a pleasant evening and hope to see you here again very soon! Our afternoon activity: Mardi Gras mask-making! This is a long-standing Shrove Tuesday tradition in our home, and I always rope as many of my boys into it as I can. ;) This year, the older boys were elsewhere (one at college and one at a homeschool class), so it was just the younger two and myself ... well, and the cat, as you can see above. You know, the cat who is NEVER allowed on the kitchen table ... ahem. After lunch I set the boys up at the table and they were eager to pitch in! (They do love crafts, these two.) So after I cut the eyeholes, they set right to work on their masks ... and, as you can see from his expression, Little Bear was quite excited to be allowed the use of markers, a rare treat in our house! For supper, we had pancakes with whipped cream, maple syrup AND colored sprinkles. There was bacon, too ... and there was meant to be homemade hash-browned potatoes but I completely forgot. Last touch - a Mardi Gras "lantern" I made with a green Ball jar and a colorful star garland I had in the cupboard. But as always, I thank you very much for stopping by and I wish you all a very pleasant evening. Our Lenten Countdown: Post-its with Purpose! Now, I know there are a lot of great plans out there for families to follow - in books and online - and many are truly wonderful resources. I love all the sharing that happens when special seasons and events arrive in our liturgical life! But usually I find it most beneficial to work around my own family's particular needs - to create a plan that takes into consideration our autistic son, our wonky schedule, (our struggles), and what lessons will be most relevant to us. In addition, it's very helpful for my younger boys to have a visual reference for how close we are to any holiday. Six weeks to Easter is a long time when you're young ... meanwhile it flies by for mum and dad! 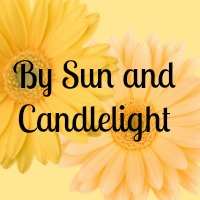 All this to say - after a little pondering and poking through my craft bins I came up with an idea that really "clicked." I decided it would be nice to make use of the purple post-it notes I've been hoarding for a year or more now - and since I have PLENTY of them (no really, anyone need a spare pack?) it just seemed to make sense that I could use 40 notes for the 40 days of Lent. That would be perfect! Well the answer - as I sat at the kitchen table, surrounded by the usual mayhem, with notes spread all around me - was staring me in the face. Right here where we are ALL the time - this is where our Lenten project should be! And just look at the lovely shape of our kitchen door ... those six panels forming a cross. Why, this would be perfect! So here was my base for all those pretty stickers! ... then covered it all up with 40 purple post-its! Starting at the bottom of the cross (the sooner we get beyond the toddler's reach the better) we'll pull a post-it each day and underneath the note will be written a simple Lenten suggestion for the children: something to give up, an extra task, a kind gesture or a special prayer to say. Perhaps a family activity that celebrates a liturgical event or faith tradition. As the days go by and the post-its are removed the white cross will be revealed underneath ... and it will be coming to life! The lesson I hope my boys take from this project - aside from boy, does mom go crazy with the crafts at certain times of the year - is this: When we give a little something to Jesus each day - we're lifting that cross alongside Him. And as we lift - purple-note-by-purple-note - we will see that we're building a beautiful thing! So now when Earlybird asks for the umpteenth time of the day hour, "How many days are there until Easter, Mama?" I will point to the cross in the kitchen and say, "Well, how many post-its are left? That's how many days." And there it will be - there HE will be - right in the middle of it all. All the clutter and craziness of our everyday life. I'm so looking forward to living Lent as a family this year - with post-its and purpose! My friends, enjoy your Thursday evening, and I will see you here again sometime soon! Would 40 purple post-its fit on the kitchen door? Well, excitement turned into curiosity for Earlybird (How many post-its tall am I?) and pouting for Little Bear (What do you mean I can't tear all these papers off the door?). ;) So I'm still working out all the details, but I think this will work nicely ... if I can keep the 2 year old's fingers busy elsewhere! Enjoy your weekend, my friends! Thank you so much for all the lovely book thoughts and pics - Our Book Party will kick off very soon! I did want to let you know that I'm having some "tech" issues at the moment, so my posting might be a bit "off" this week - but I wanted to share this quick project with you all ahead of this (Ash) Wednesday. Very simply, I wrote a brief note on the inside of each strip. What is this day? What might I give of myself for someone else? (So, examples would be: "Clean up Little Bear's blocks. Bring Crackerjack's laundry downstairs. Help CJ with trash. Help Mama make supper. Etc.) Helping with chores is not something EB typically likes to do so it will be a sacrifice for him to make these offerings. Before hanging the chain, I jotted down each strip's note in my Lenten Planner so I would be aware of what EB would be reading that day (and could prepare for things I suggested). Then I taped the loops together and hung them up in the kitchen, along the learning wall as seen above. I anchored the chain to the maps with small, wooden clothespins. Well my friends, I hope this day finds you safe and comfortable, wherever you are and whatever your weather. I have a really fun post to share next time! I've been busily nailing down those housekeeping routines - plugging tasks into a schedule - and I will be sharing it with you all very soon. It's a rather large project and I'm still trying to iron it all out, but I think it might be the most comprehensive list of housekeeping I've ever written! So stay tuned! The wrap on his head was covering the electrodes and wires - the backpack he's wearing held the transmitter into which the wires fed. It still amazes me he wore all of this - and that he slept with it! So I made the six Sundays a separate part of the poster - in the form of pretty lavender index card crosses (one is pink for Rose Sunday) that sit off on the side. (I made these from index cards.) On Sundays I will write something special on each cross ~ a few joyful words of encouragement. You can see where we started at the very bottom with EB's 1st smiley face sticker. So at the end of each day EB will place a sticker over the day's number and so on throughout Lent, moving ever closer to Easter Sunday, and the top of the chart. Now, Lent is about sacrifice, but for Earlybird, we're encouraging little acts of kindness/extra effort each day ... giving a little more of ourselves can be its own kind of sacrifice, after all. And really, all he went through this week with the EEG and hospital visits was a true trial ... I told him last night as he applied his sticker that he was very brave and did things he really didn't want to do. Today he has to let me wash his hair (to get more glue out) and I know he really doesn't want me to do that. But I will remind him that sometimes we have to give up a little of our comfort for a greater good. (It's a big and perhaps confusing concept for my little guy but it won't hurt to say it.) Tomorrow I'll suggest a kindness we can do for someone else and have Earlybird help me complete it. Each day we'll do a little something and over time, fill our chart with smiles, and bring ourselves steadily closer to Easter. So that's the plan I finally decided upon, and I'm happy with how the project came out ... more importantly, Earlybird seems happy with it! I hope it helps him pass the time until our next family celebration ... and perhaps stretch himself a little as he gives a bit "extra" every day. From the "food pages" ... 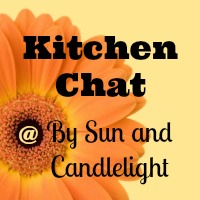 I'm loving all the suggestions for our "Kitchen Chat" series, which begins on Monday. I wanted to announce that our first topic of discussion will be "seasonal eating" as it seems to be a very popular concept! I also want to stress that I will simply play host(ess) for these chats - I don't mean to profess any sort of expertise in any area! I will share my own take on the topic and then open the "thread" up for comments. So please think about your own idea of "seasonal eating" and if you have any questions or thoughts to share on the subject ... on Monday we'll begin our conversation! In "baby news" ... Little Bear had his 9-month check-up today and it went great! We talked with our pediatrician about finger foods, as LB is at that transition stage - from smooth to chunky. I always find this a challenge - figuring out what are good (safe) options to offer. (Suggestions?) We actually gave LB some steamed butternut squash the other night ... and despite the faces he's making here, he seemed to like it! A quick "weather report" ... things got a bit crazy this afternoon! We had a sudden whiteout ... and then five minutes later it was bright out! And finally, in "family faith" ... Lent begins next week ... are you ready to bury the Alleluia? Hope you all have a nice evening ... see you here again very soon! Actually, these are easy-peasy blueberry scones, with some homemade frosting piped on top in the traditional cross shape. Note the odd one in the back - the one with the O, rather than the †? That was Bill being frisky, an attempt to play tic-tac-toe while I prepared the buns. Well, I hope your Easter weekend is off to a nice start! Bill's home today and we're having a quiet afternoon, preparing for our family gathering on Sunday. This morning I had a midwife appointment and there we talked about lots of things - including my weekly appointment schedule from here on out (every Friday till the end of May) and a possible induction date (considering my super-fast deliveries of both Crackerjack and Earlybird). I have a feeling I will go sometime before my due date anyway, but we'll know more as the weeks go by. What was really neat at today's visit ~ my mum came with me so she not only got to meet my midwife, but she also got to hear our little Baby-O's* heartbeat. He's always so scrappy when they use that doppler wand ... flipping around and giving a little show! So all is going well ... I'm going to start on a magnesium supplement and daily protein shakes ... we'll wait on the thyroid testing to see how things go and/or if any other symptoms arise. And I had the echocardiogram last night and it went well ... that is, the test was smooth and the technician was lovely (an old high school classmate as it turned out!) but I'm waiting to hear what the cardiologist made of things. My midwife assured me that palps and an obvious heartbeat are very common in pregnancy and that all this testing is just to be extra cautious. That made me feel better! Enjoy the rest of your Friday, my friends ... and a happy holiday weekend to all!